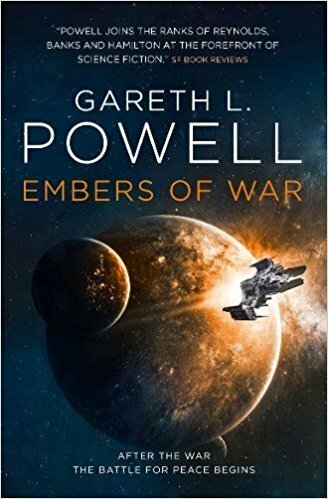 Book one in a new trilogy, Gareth L. Powell’s Embers of War is the first instalment of an instantly familiar-feeling sci-fi trilogy, a tale of sentient ships and down-at-heel characters in the aftermath of a terrible war. Captain Sal Konstanz and the crew of the Trouble Dog race to the site of a downed ship, among whose passengers is someone of surprising importance to both sides of the war. 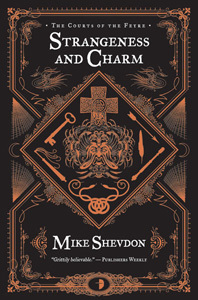 Members of the humanitarian House of Reclamation, the Trouble Dog and its crew are on a rescue mission, but they soon find themselves tangled in something much more complex and dangerous. You can’t write a space opera with sentient ships without referencing Iain M. Banks’ Culture novels, and that influence looms as large as you’d expect over this book… but never dominates. This is a universe that’s a bit dirty and rundown, and still feels connected to the real world; there’s less of Banks’ hard tech and dense storytelling, and it’s an interesting middle ground between the extremes of gritty grimdark and bright, hopeful sci-fi. You just need to look at the House of Reclamation, a sort of galactic Foreign Legion which exists to rescue ships in distress and provide a quiet, no-questions-asked existence for souls looking to escape their past. These characters – the Trouble Dog included – are all a bit beaten down, under-equipped and ill-prepared for what life is about to throw at them. They’re bruised and battered, but thankfully don’t veer into self pity, which is testament to Powell’s knack for interesting, relatable characters. 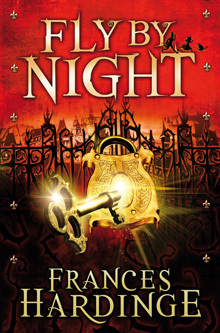 Structurally the book uses short chapters which rotate through multiple viewpoints (including the Trouble Dog itself), so the characters’ histories and idiosyncrasies are revealed slowly over the course of the story; it does mean there’s maybe not the chance to really dig into them, but it does provide some interesting opportunities and overall it keeps the plot racing along nicely. While this has the usual sense of scale and ambition for a space opera, it’s also somehow quite well-contained. 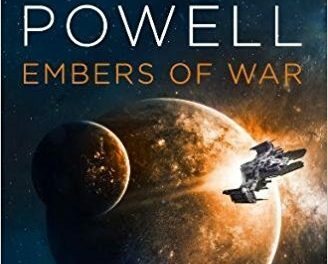 There’s no need for reams of exposition or massive info-dumps, instead Powell sets a cleverly-plotted and well constructed story to a background that hints at all the scale without the need to push it in our faces. As the titles suggests, the shadow of war hangs over everything, not in a dense or overbearing manner, providing a powerful, effective backdrop that informs characters’ decisions throughout the book. It’s a book that feels familiar enough to be instantly engaging without ever feeling derivative, instead content to wear its influences on its sleeve. 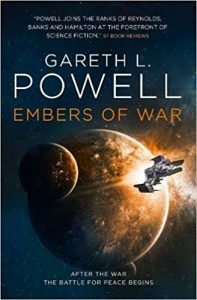 It’s hugely entertaining, and hints at a wider universe with the tantalising prospect of filling a Banksian hole in modern sci-fi.